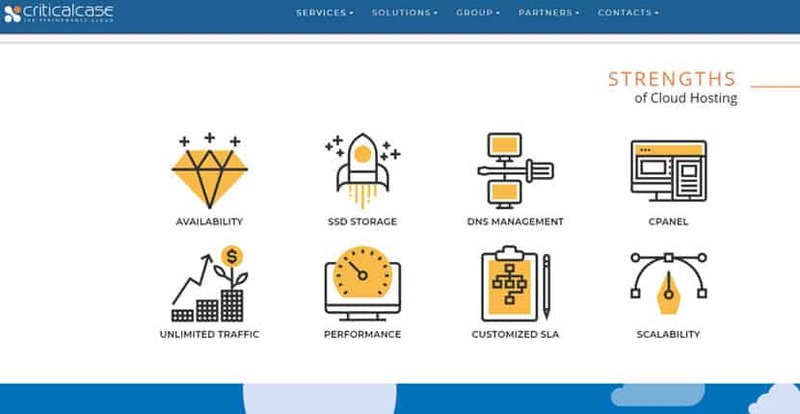 Criticalcase Review 2019: Is Criticalcase a Good Hosting? Criticalcase is a one-stop cloud service provider that offers specialized managed hosting solutions. Founded in 1999, Criticalcase is a hosting provider that delivers cloud services and unmatched web experiences combined with a Content Delivery Network. Its offices are based in Italy and Switerzland, and it operates out of seven data centers across Europe in Turin, Milan, Amsterdam, Paris, Frankfurt, and London. Each of the data centers have a 99.99% network SLA and are ISO-27001 and 9001 certified. Services are available in English and Italian. They have now turned out to build a working relationship with firms out there in both Italy and Europe. They run their services from their offices in Italy and Switzerland with their Datacenter in U.K, Netherland, Germany, Italy and Ukraine. Their customer service language is quite multilingual and is basically translated to American and British English, German, Hindi and Italian, with the highest percentage falling on the Italian Language. Since Criticalcase’s solutions are customized for the needs of the organizations it works with, there aren’t any pre-made packages available. Instead, you’ll have to contact the sales staff for a consultation. Criticalcase also offers security solutions, backup services, monitoring services, and enterprise-level managed hosting services. Note that this web hosting service does require more technical proficiency than your average platform, however, so I would not recommend it for absolute beginners. Since Criticalcase doesn’t have any pre-made packages available for perusal, it’s difficult to ascertain just how its prices fare with those of its competitors. However, given the number of data centers the company operates out of and the fact that it boasts a “best-in-class” cloud hosting technology, it’s fair to assume that Criticalcase’s solutions won’t come cheap. 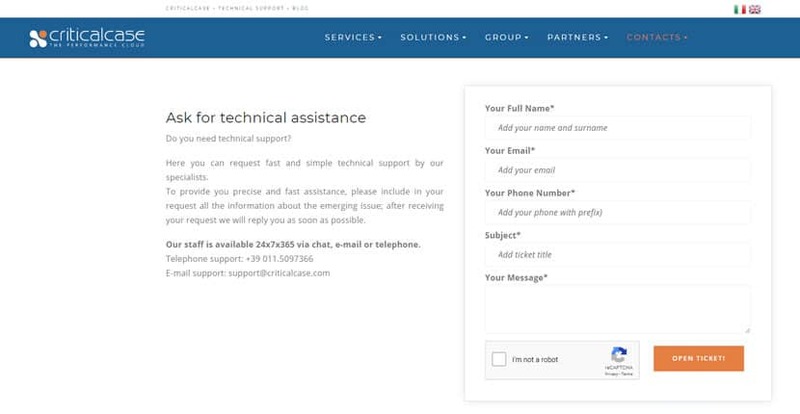 Support is available around the clock all year via email, tickets, chat, or telephone. There’s only a local number listed for Italy, however, and it appears that the live chat is only for those who can speak Italian. This means that if you’re using the service from a different country, you may encounter a language barrier. Criticalcase is an excellent hosting provider if you’re looking for cloud services in Italy or the surrounding European regions. However, it’s not a platform well-suited for beginners. Wondering how Criticalcase stacks up against other Web Hosting companies? Enter any other Web Hosting company and we will give you a side-by-side comparison.